Making a philanthropic gift to your favorite cause has become easier over the years. Today, the traditional means of giving through the mail and in person are augmented by online giving and automatic debits from your checking account. It's so easy to give, but how do you know how well an organization is using those gifts? During the past fiscal year, 83 percent of DU’s expenditures were converted directly to conservation work vital to ducks, geese and other wetland-dependent wildlife. In addition to our outside auditors who ensure that we are doing what we said we would with your dollars, there are also other ways to tell if DU is effectively using your gifts. One of the most valuable certifications comes from the Better Business Bureau Wise Giving Alliance. DU meets all 20 Standards for Charity Accountability. The Alliance bases its decision on audited financial statements and a stringent 20-question rubric that reviews DU's governance and oversight, organizational effectiveness, financials, and fundraising and informational materials. You can view the report on DU at www.bbb.org/charity by clicking on "Check out a Business or Charity" and searching for Ducks Unlimited in Tennessee. Ducks Unlimited has also received the "Top-Rated Charity" designation from the American Institute of Philanthropy. Our A- rating generally means that we spend 75 percent or more of our budget on programs, spend $25 or less to raise $100 in public support, do not hold excessive assets in reserve, and disclose basic financial information and documents to AIP and our donors. Each year The Chronicle of Philanthropy compiles "The Philanthropy 400," a list ranking nonprofit organizations based on the amount of money raised (not including government funds) in the previous year from individuals, foundations, and corporations. Ducks Unlimited has been a consistent member of the list rising as high as 120; for 2010, we were ranked 131. We were one of 16 groups in the ‘environmental/animal welfare' category to be included, second only to TNC in our ranking.  Ducks Unlimited is committed to doing our best work with dollars you invest in our mission. We appreciate the outside validation from the organizations above, but our greatest validation comes from the continued support of people like you!